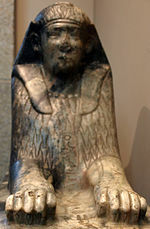 Small gneiss sphinx inscribed with the name of Amenemhat IV and reworked in Ptolemaic times on display at the British Museum. uncertain Southern Mazghuna pyramid ? ↑ Alan H. Gardiner: The Royal Canon of Turin, Griffith Institute, Oxford 1997, ISBN 0-900416-48-3, pl. 3. หน้านี้แก้ไขล่าสุดเมื่อวันที่ 24 พฤศจิกายน 2560 เวลา 21:51 น.